The Woot Hoodie follows a traditional style, and not the “slim” fit you expect from our t-shirts. Purchase accordingly, or you'll never get your sad emo hoodie look just right. Measure front of chest under arms across the fullest part of the chest. Be sure to keep tape level and comfortably loose. 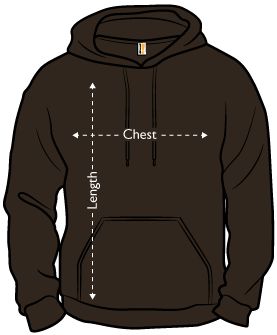 Measure hoodie from the seam at the neck to the bottom of the garment. Measure from the halfway point between shoulders. Measure across to shoulder, then down along arm to wrist.